Reginald was born in Boughrood (or Bochrwd), Radnorshire in 1891 the son of William George and his wife Leah née Mathews. When the census was taken in 1871 10 year old Leah was staying with her grandparents in a cottage near Felton Court - the farmhouse home of William Roert George and his family, including young William, aged 4. Twenty years later William and Leah married – a few months before the baptism of their first child, Reginald, in the local Anglican church on 12 July 1891. Six more children followed their birthplaces documenting the move of the family around the country: Edgar Claud (born 1893, Boughrood), Roland Charles (1895, St Maughans, Monmouthshire), Lilian Annie (1896, St Maughans), Frank James (1899, Greenham), Gwendoline May (1900, Greenham), and Ernest Alfred (1903, Greenham). William was a gamekeeper and he passed his skills on to young Reginald, by 1911 both were working for the Shaw Estate north of Newbury (The Hon Mrs Farqharson). The job came with a cottage on New Farm (one of several farms on the estate). This was not William’s first job in the Newbury area, in 1901 the family was living at Aldern Bridge and in 1911 on Wash Common. These locations might indicate employment on the Sandleford Estate which dominated these areas to the south of the town. By 1914 Reginald had moved on to work on the Englefield Estate (Mr J H Benyon). When the call to enlist came immediately after the declaration of war on 4 August 1914 it did not take Reginald long to respond. He joined up with the Royal Berkshire Regiment in early September electing to join the Territorial arm of the service. The Territorials were a popular choice, unlike the newly created Kitchener battalions that absorbed most new recruits, the Territorials were issued with uniforms and rifles (it took months for the supply of such items to meet the massive surge in demand), and the Territorials were local men, a new recruit would be bound to know some of his new comrades from school, work or the local pub. By the time Reginald joined it the local Territorial battalion (4th Royal Berks) had already split into two battalions and would soon create a third - leading to the awkward Territorial nomenclature of the 1st/4th, 2nd/4th & 3rd/4th Battalions. The core of the 1st/4th or 1/4th Battalion that Reginald joined were the pre-war Territorial troops who, on the outbreak of war, had signed the Imperial Service Obligation – indicating their willingness to serve overseas, despite the Territorial commitment being limited to home service only. The higher echelons of the Regular Army did not think much of the Territorials as troops – Sunday soldiers as they were derisorily nicknamed. However, by early 1915 the reserves of the Regular army were used up; Regular units from all over the empire had been recalled and thrown into the battle in France and Belgium, the Indian Army had supplied two divisions. The hundreds of thousands of new recruits in Kitchener’s Army were not ready – the only hope was the Territorial Army; from late 1914 they began to arrive in France. 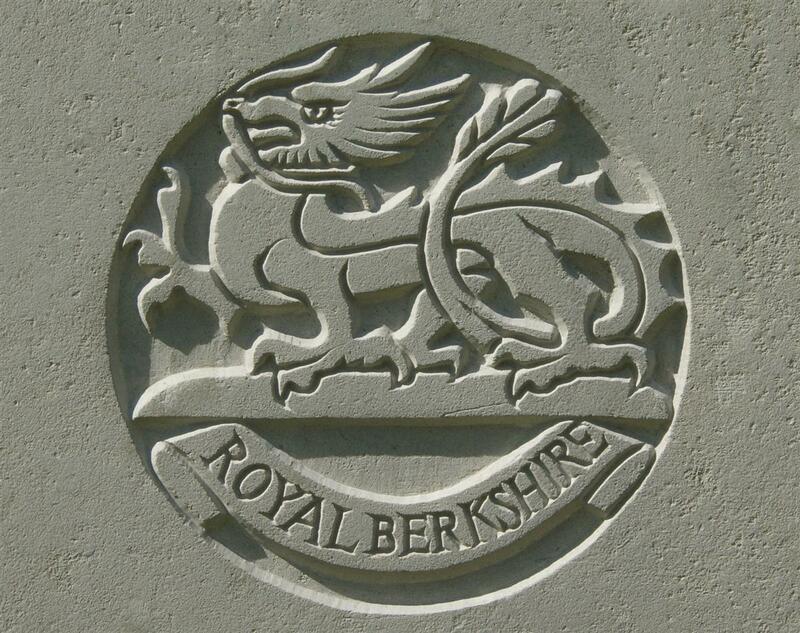 The 1/4th Royal Berks operating within the 145th Infantry Brigade formed a part of the 48th (South Midland) Division, which crossed the Channel on 30 March 1915 and was soon learning the ropes from experienced units manning the line at Ploegsteert Wood – known to the Tommies as Plugstreet. After this training/familiarisation period the Division moved south to the area around Hebuterne. For over a year the Battalion experienced life as a frontline unit – uncomfortable periods, a few days at a time, in the line interspersed with longer periods in support lines or rest/training billets further from the enemy guns. Regular casualties occurred, victims of shelling, sickness or snipers or the occasional trench raid, but the battalion was not called upon to make a full scale assault on the enemy positions. During the Battle of Loos in September 1915 the 1/4 Berks assembled up in the line in preparation for an attack only to hear that the assault was cancelled – events elsewhere having failed to have the anticipated success. In June of 1916 Reginald had bad news from home; his father, William, had died aged only 50. His death meant the loss of their tied cottage; Leah moved into Newbury, first to Gloucester Road and then to 12 Priory Road. On 2 July the Battalion moved forward from their billets in Mailly Maillet – at last they were to get their chance at the Hun. But once again they were to be disappointed – the previous day was infamous ‘first day of the Somme’ when casualties were so high that the follow-up assaults had to be postponed while the forward trenches were cleared of the dead and wounded. Not that the planned follow-up was appropriate, few if any of the initial objectives had been achieved in this section of the front. It was not until 23 July that the Battalion finally took part in a major assault. The 145th Brigade was tasked with an attack near Pozières – the 1/4th Berks and the 1/4th Oxfordshire and Buckinghamshire Light Infantry (OBLI) were chosen as the assault battalions. It was a sobering baptism of fire (25 killed, 103 wounded). Reginald survived to fight another day. 13 August Were in support to the Oxfords who were holding the front line. At 10.30 pm a message was received from Brigade to send up more bombs to the OXFORDS and two platoons were sent up. This was the first intimation we received that the 6th Avenue trench had been taken by the enemy. About 12.50am(14th) the Brigade ordered by phone a Company to be placed under the CO of the OXFORDS – I ordered D Company to proceed at once, taking with them a further supply of bombs and another Company to First Avenue, North of Fourth Street. I was in constant communication with OC 4th OXFORDS: he informed be he only required one Company. About 2.55am I received orders from the Brigade to counter-attack as soon as possible, and retake the trench. At 3.0am I issued orders for the attack. C and D Companies and one platoon of A Company went over the top, but though they advanced with the greatest bravery, most gallantly led by their Officers, the Machine Gun fire was so intense, chiefly coming from the Left, that the attack failed. Officers: Killed – Captain Attride, 2/Lieut Beasely, 2/Lieut Bartram; Wounded – Captain Blandy, Captain Lewis, 2/Lieut Taylor; Killed – Lieut P G W O’Hara (3rd East Surrey Regt attached). GEORGE – Aug 14, Lance-Corpl Reginald William George, Royal Berks Regt, the dearly loved and eldest son of the late William George and of Mrs George, of New-farm, Shaw, Newbury, Berks, late of Wash Common. Official notification has been received by Mrs George, New-farm, Shaw, that her eldest son, Lance-Corporal Reginald William George, was killed in action in France on August 14th. Lance-Corporal George, who was 25 years of age, enlisted at the outbreak of war, was trained at Maidenhead, Northampton, and Chelmsford, and in March, 1915, was sent to France. He has been home twice, the first time in November 1915, and again in June of this year, after the death of his father on June 7th. Before enlistment he was a gamekeeper in the employ of Mr J H Benyon, of Englefield. Mrs George, who has received many expressions of sympathy in this her second sad bereavement, she having lost her husband in June last, has two other sons on active service, Pte Edgar C George, who is serving with the 18th Welsh Regt in France, and Roland C George, who is on a Destroyer in the North Sea. Reginald was buried in grave IV. G. 11 at Pozieres British Cemetery, Ovillers-La Boisselle. He was buried there on 12 May 1919 – his body had been discovered on the battlefield. Back in Berkshire Reginald was remembered on the town war memorial in Newbury (tablet 5) and on the Roll of Honour in the church of St John the Evangelist (detroyed when the church was bombed in 1943). When a headstone was erected on William George's grave in the churchyard at St Mary's, Shaw, an additional inscription in memory of Reginald was included. See here. 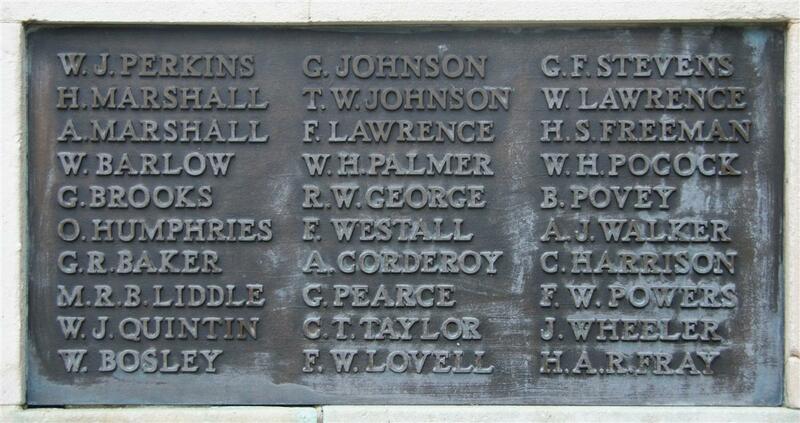 Reginald's brother Roland Charles George is also commemorated on the Newbury memorial, but not as a casualty of the Great War. Roland died in 1941 while serving on HMS Dunedin when it was sunk by U124 some 900 miles off Freetown, Sierra Leone. Around half the crew of 500 survived the sinking, but their numbers dwindled rapidly as they lay on or clung to Carley floats in the equatorial heat. Some died of injuries received in the sinking others to shark attacks and many collapsed due to heat exhaustion. Only 78 were still alive when the floats were spotted by a passing US merchant ship, the Nishmaha. Roland began his navy career in June 1914, when he enlisted as an officer’s steward class III. His first sea going posting was on a brand new destroyer, HMS Kempenfelt, which he joined on 22 September 1915. Three years later, on 2 September 1918, he transferred to another destroyer, HMS Lysander. He remained in the navy until 1928, serving for two years on HMS Hood, during which time he worked for a while as Admiral’s Steward (for which he received the pay of a Chief Petty Officer). When war was declared again in 1939 he returned to duty, with the subsequent fatal consequences. The newspaper report of Reginald’s death mentions his brother Edgar Claud George as serving in France with the 18th Battalion, Welsh Regiment. It seems likely that he was wounded or became ill enough to warrant a transfer out of this infantry unit and into the Labour Corps. After a period with the Labour Corps he transferred again, into the Army Service Corps. He survived the war but died in Reading in 1943, aged 49, his unmarried sister Lilian was executor of his estate. Reginald’s third brother, Frank James George, was born in 1899, so would have been eligible for conscription in mid to late 1917. At that time the army did not send men overseas to a theatre of war until they were nineteen, however Frank seems to have been one of the 18½ year olds caught up in the panic of spring 1918 when the German’s came close to breaking the British lines along the Somme front and, the army was suddenly desperately in need of reinforcements. On 10 April the government temporarily lowered the qualifying age by six months. Frank was soon sent to France to join the 1st/4th Battalion of the Yorkshire Regiment; a part of the 150th (York & Durham) Brigade in the 50th Division. Many of the units hardest hit by the Germans were moved north, to a quieter part of the line in order to absorb drafts of reinforcements and reorganise in preparation for future action. Sadly they were moved to the next target of the German offensive. The exhausted veterans and green newcomers were hit again by overwhelming force. Once again the survivors from 50th Division were moved to a quieter sector, this time south to a French sector on the Aisne. On 27 May 1918, the Germans struck with the third and last phase of their desperate attempt to defeat the Allies before the Americans arrived in force. This third onslaught hit the 50th Division which the French sector commander had put in the line in order to release a fresher French division to move north to the fighting. The Division was all but annihilated. Following the initial assault the 150th Brigade was reconstituted as a battalion – indicative of losses of 75% or more. Mrs George, of 38, Gloucester-road, would be glad to hear of any tidings of her son, Pte F J George, of the Yorkshire Regt, who was reported missing in France on May 27. Mrs George, of 38, Gloucester-road, has received a card from the British Red Cross Society stating that her son, 35621 Pte F J George, 10th Platoon, ¼ Batt, Yorks Regt, who was reported missing on May 27th 1918, is a prisoner of war. After the war Frank was repatriated to England where his conscripted service ‘for the duration of hostilities’ was complete. However, he decided to re-enlist for a further three years service. This may appear a strange choice for a young man whose only experience of battle was to be overwhelmed and captured - and quite possibly wounded, but the incentives offered by the Army were attractive. Immediate home leave for two months (no waiting for your turn to be demobbed) and a bounty of £40 if enlisting for 39 months. £40 was a lot of money in 1919 – even if it was payable in four instalments. 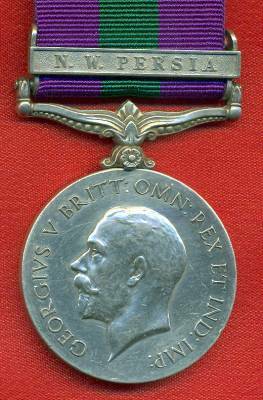 In 1920 Frank served in the North West Persia Campaign with the 1st Battalion, Royal Berkshire Regiment, earning a campaign clasp for his GSM (Good Service Medal). He died in Newbury in 1977. The last brother Ernest Alfred George was too young to serve in the war.